Extreme fire events are being reported around the world, in some cases involving substantial loss of life and property. Understanding the global pattern of extreme fires, and their relationship with climate conditions and human settlement patterns is a basic step in knowing if extreme fire events are like other natural hazards to which humans must adapt, or if humans have increased their vulnerability by not only building in dangerous environments, but also by increasing fire danger through inappropriate management of fuels and ignitions. If weather conditions are the main driver of extreme fires then climate change may make a bad situation worse. Resolving these issues demands a geographic context. Existing records of fire disasters were too fragmentary to provide a coherent global perspective. So I formed a team to create a global database to illuminate the ‘pyrogeography’ of extreme fire events. As I explain, I was strongly motivated to do this work because I live in a city that was very nearly destroyed by a huge conflagration 50 years ago. I live in Hobart, the capital of the temperate island of Tasmania. On February 7, 2017, Tasmania is marking the 50th anniversary of the Black Tuesday bushfire, which killed 62 people, left 900 injured, and destroyed 1,400 homes. With slightly different winds the fire could have been driven into the centre of the city. For Australian fire managers, the 1967 bushfire has served as a historical benchmark, framing thinking about the destructive capacities of landscape fire. However, since turn of this century the 1967 Hobart disaster has been eclipsed by a spate of extreme bushfires, like the 2003 fire that burnt into the suburbs of Canberra, the capital of Australia, and the notorious 2009 Victorian Black Saturday Bushfire that killed 173 people and had an economic impact of over 4 billion dollars. On 4 January 2013, Tasmania experienced an extreme fire event that destroyed the small township of Dunalley that presented the world with the iconic image of a family taking refuge under a pier. What was not widely reported was that a Tasmanian wilderness fire, known as the Giblin River fire, that is one of the largest fires in the Tasmanian historical record was burning at the same time (French et al. 2016). Both fires were driven by extreme fire weather conditions, but the Dunalley fire was ignited by a smouldering log in a debris pile and thus ultimately caused by humans, whereas the Giblin River fire was caused by a lightning strike and set by nature. 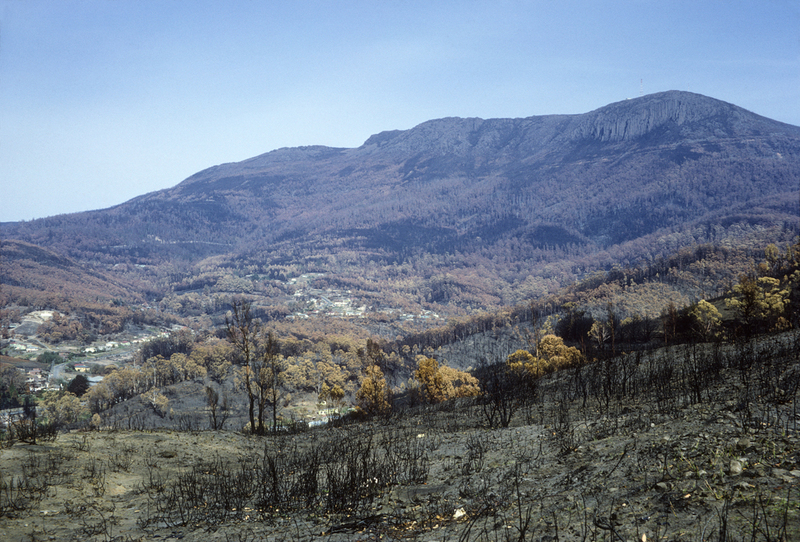 Mt Wellington following the 1967 fire (courtesy of Keith Roberts). 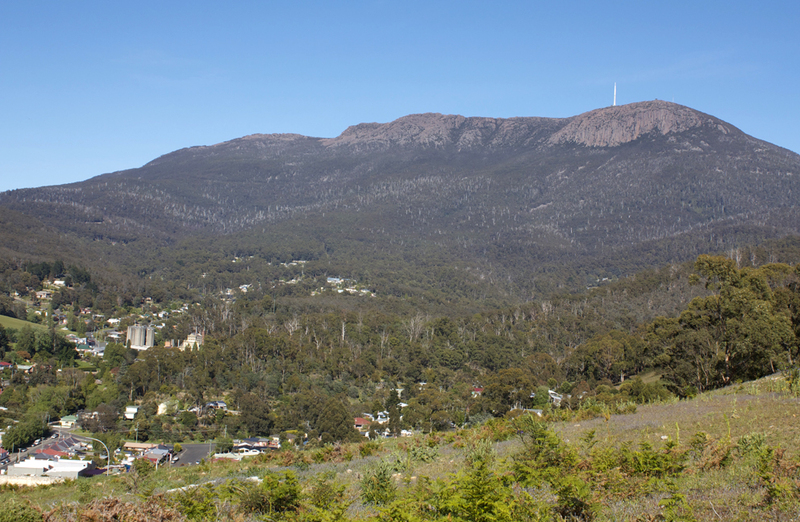 2016 view of Mt Wellington that looms above the city of Hobart, Tasmania. 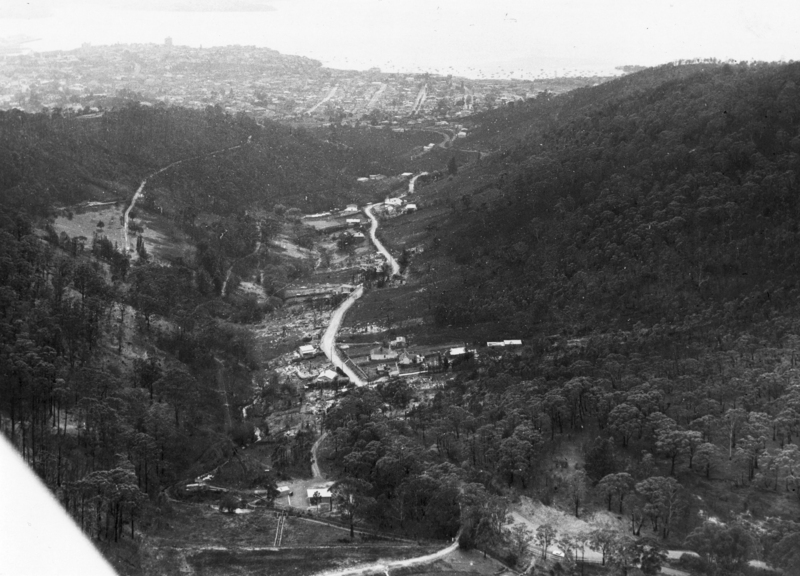 Note that the city has expanded into the area that was severely burnt by the 1967 bushfire (courtesy of Tasmanian Museum and Art Gallery). Extreme fires are increasingly being reported around the world, ignited by both humans and lightning. In the United States, large wildfires routinely destroy buildings and cost lives, including those of fire fighters tasked to suppress them; while in Europe extreme fires occur even in countries that set considerable money aside to prevent them. These extreme events raise numerous questions: Do extreme fires afflict all flammable biomes or have humans exacerbated this issue? Is there a trend for worsening fires? Is climate change making a dangerous situation worse? Making sense of these extremely destructive fires demands a historical and geographic context. And here is the rub: there is no reliable global database to answer these questions. It is true that analyses of charcoal in lake sediments have illuminated the history of landscape fires around the world but this approach cannot reconstruct individual fire events, particularly the extent and intensity of any given fire. Likewise, global analysis of fire weather has revealed a recent historic trend in longer and more extreme fire weather seasons, yet fire weather and actual fires are not perfectly correlated. Satellite imagery has revolutionised understandings of landscape fire activity globally, yet the focus of most analyses has been on the area burnt, not extremely destructive fires that cause economic damage and loss of life. As the experience in the Tasmanian 2013 fire season graphically demonstrated, fire size and destructive impact are not necessarily related. I wondered whether it would be possible to advance this problem using some measure of fire intensity recorded by satellites. I had been working with Grant Williamson in my lab on statistical modelling of smoke plumes. We had found that the sum of the fire radiative power (FRP) of pixels on wildfire edges detected by the MODIS satellites predicted smoke plume sizes, so it occurred to me that a global lattice of MODIS FRP measurements could create an index of wildfire intensity. Grant Williamson wrote the code to develop such a database using a 10 x 10 km lattice and, after months of refining the computations, had created a daily collection of over 23 million potential wildfire events. We reasoned that selecting the upper 500 events would definitely provide a representative sample of the most energetic and extreme fires on Earth. The catch was working out if we had actually captured wildfires rather than other energetic events like volcanic eruptions or industrial fires. We had a big verification task ahead of us! Around this time, I was invited to join a team from the University of Idaho who were working on a paper for BioScience concerning the capacity of humans to adapt to the challenge of co-existing with wildfires: one of my contributions to that study was as a case study from southern Australia, illustrated with Hobart’s dangerous wildland-urban interface. This collaboration was a consequence of a project I was working with Mark Cochrane, from South Dakota State University, which has led to several papers on the pyrogeography of Australia. This work has already highlighted the fragmentary data available to characterise fire regimes, particularly fire intensity, across Australia and indeed elsewhere in the world. The enthusiasm and skills of the Idaho team was a critical development in our research. First, Crystal Kolden undertook the massive verification process of each of our top 500 fire events using available online databases to determine which events were actually wildfires (this process reduced the number of events to 478), and if it was, whether it caused economic or social harms (we recognised 144 such disasters), with assistance from Alistair Smith who also checked that the spectral signatures were consistent with a fire event. John Abatzoglou was then able to provide the essential climatological context for each event, enabling us to understand antecedent and current weather conditions associated with each fire. A remarkable feature of our collaboration was that it was not until the final stages of the project that we were all able to meet in person – Grant Williamson and I added a side trip to Moscow, Idaho following a fire conference to spend a few days with the team in early 2016. Our paper has helped settle some critical issues in pyrogeography that are of both fundamental importance and applied significance. First, energetically extreme fires are a global and natural phenomenon, particularly in forested areas that have pronounced dry seasons. Such extreme fires are associated with anomalous weather – such as droughts, winds, or, in desert regions, following particularly wet seasons. Second, we found that economically and socially disastrous extreme fires were concentrated in regions where humans have built into flammable landscapes, such as areas surrounding cities in southern Australia and western north America. Significantly, the European Mediterranean region had fewer fire disasters than southern Australia and California even though all have similar climates and vegetation. Unfortunately, there are increasing extreme (and historically anomalous) fires in the Mediterranean due to urban sprawl into flammable landscapes combined with the loss of intensive land use due to the migration of rural workforces to cities. Third, climate change projections suggest that the geographic footprint of dangerous fire weather is likely to expand globally – more extreme fires are predicted along the Australian east coast, including Brisbane, and the whole of the Mediterranean – Portugal, Spain, France, Greece, and Turkey. As such, our results suggest that extreme wildfires impacting these southern European communities may simply be a matter of time. Our study’s publication on the 50th anniversary of the 7 February 1967 Tasmanian fire disaster is a fortuitous coincidence that helps highlight the global vulnerability of cities surrounding by flammable forests, regardless of climate change. Disturbingly, the current global trajectory of low density housing in flammable forests, combined with rapidly increasing dangerous fire weather due to climate change, will lead to more fire disasters. 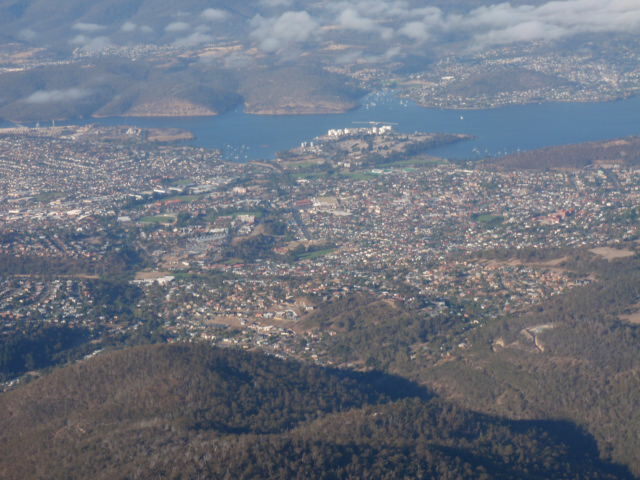 View of Hobart's urban sprawl into the bush of Mt Wellington, note that large areas of Hobart are now exposed to bushfire risk that is likely to increase under global climate change (photograph by David Bowman). There is an urgency to fire-proof vulnerable cities in order to effectively live with fires and create fire resilient communities: a cultural mind shift is required such that vulnerable communities accept the economic costs of mitigating extreme fires just as inhabitants of earthquake-prone cities understand the need for planning, urban design and building to withstand major shocks. The historically rare occurrence of extreme fires in the Mediterranean demonstrates that land use – thinning of trees and intensive management of fuels - can significantly reduce the risk of extremely destructive fires. Our paper reinforces the major research and policy challenge of finding ways to optimize human community resilience to wildland fires and effectively live with landscapes prone to support extreme fire events. Poster image: Mr and Mrs P Gard of Sorell watch the blazing contents of their home (image from the Mercury Historical Archive Collection courtesy of the Tasmanian Museum and Art Gallery). Very interesting paper!! I would like to have more data especially for Med.